Have any of you come up with an elegant way to continue recording if your Horus / Hapi were to die in mid session? By developing these devices with built in preamps, A-Ds, and all the IO and routing one would need, Merging has moved themselves directly into the 'pinch point' - the place where a gear failure would be potentially catastrophic when on location for instance. I know they have been very stable but as we do more and more live events I can't help but try to address how I would handle a failure while on the road. I can't currently see any sensible way through this without giving up considerable functionality of the Merging hardware (using it just as a MADI router for instance) or bringing out multiple units (which still doesn't solve a failure during a live event or even possibly a union recording session). I still wish the redundant Ravenna outputs would become functional. And I would also feel better if the Horus / Hapi went into a default mode of passing the last configuration or 1-in to 1-out etc. when there is something other than a power failure (such as RME gear will do in some cases). This was our original thought when we asked for the direct outputs. This was the only way to get outputs of the network failed. Unfortunately, the only way to get real redundancy is to feed to two Horus from external preamps. That is what they did at the San Francisco Symphony. This is a very interesting point. I took the cover off my Horus and Hapi for a sticky-beak. It seems that, once again, the PSU maybe the most probable failure item, and Horus has two of them wired in parallel. But it gets expensive and logistically complicated to think about a dual Horus's fed from the required number of external racked preamps and splitters. Surely a second whole system is simpler:, buddy strapping of double mics, double cables to a set of pres and recorders of different type. DJS wrote: This is a very interesting point. I took the cover off my Horus and Hapi for a sticky-beak. It seems that, once again, the PSU maybe the most probable failure item, and Horus has two of them wired in parallel. But it gets expensive and logistically complicated to think about a dual Horus's fed from the required number of external racked preamps and splitters. Sarcasm duly noted....but the real question here is what the fundamental reliability of the system is and how to deal with the risk. We carry spare microphones in case of a failure, run duplicate runs of network cable and we still carry a spare Horus frame with us on all jobs in case of a failure. Will it help us until we can swap out the defective unit? No, but experience tells you what the likelihood of failure of a specific item is and you prepare accordingly. We double mic principal wireless/wired solo mics, and other things that couldn't be easily swapped out in short order. We also use the redundant supplies in all the Horus and the DC input on the Hapi all the time. In the case of Horus/Hapi, we've built them in modular frames and and included multipin parallel outputs for the XLR microphone inputs so we can drop another unit on top and connect the preamps together with multipins and be changed over in about two minutes. Finally, you need to make the judgement call about what would happen in a failure situation. If you are putting a man on the moon, then yes, redundant redundant is called for, however if you lost the second violin mic, of a multitrack recording, would it really matter? Sorry Mark, I certainly didn't intend to be sarcastic in any of this. When I had my +48V phantom power failure on my main Horus unit about a year ago, I was able to swap in another unit fairly quickly just as Mark suggested. I could see how buying a whole unit just for this purpose is nowhere near practical in terms of cost effectiveness, though. Also take into consideration you'd have to either purchase duplicate AD & DA cards or reinstall all the cards in the spare unit when there's a failure. Another minor point is that the cards need to be in the correct order for EasyConnect (or browser-set gains) to correctly identify the mic pres and set the gains correctly. Otherwise you're starting from scratch. Want to laugh? After swapping units I still needed two channels of phantom on the one that failed. 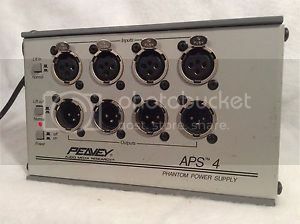 So I used what was available: a spare Peavey +48v supply. That's what I call crude but effective!